Speaking for the first time against attempts to politicise the stand-off by the ruling BJP, some Opposition party leaders even read out statements made by PM Modi and Amit Shah in the wake of the Indian Air Force strikes on a Jaish-e-Mohammad training camp. While reiterating their support to the armed forces in the fight against terror, 21 Opposition parties Wednesday said that they were anguished over the “blatant politicisation” of the sacrifices of armed forces by the “ruling party”. In a statement, Opposition parties urged the Government to take the nation into confidence on all measures to protect India’s sovereignty, unity and integrity. The statement was issued after a three-hour meeting at the Parliament Library, where leaders of the 21 parties also expressed concern over the prevailing security situation in the country. Opposition parties also condemned the “dastardly” Pulwama terror attack by “Pakistan-sponsored” terrorists of Jaish-e-Mohammad on February 14, in which 40 CRPF men were killed in a suicide bombing. The meeting began with a minute’s silence for those killed in Pulwama and the leaders resolved that while there are many important livelihood issues to discuss such as jobs and agriculture, the present situation with Pakistan would have to take precedence. The meeting was called to draw up a common minimum programme and a national pre-poll alliance but instead, the parties focused their attention on escalating tension on the border after Pakistan claimed it carried out retaliatory strikes in India and announced it had in its custody an Air Force pilot. Speaking for the first time against attempts to politicise the stand-off by the ruling BJP, some Opposition party leaders even read out statements made by Prime Minister Narendra Modi and BJP president Amit Shah in the wake of the Indian Air Force strikes on a Jaish-e-Mohammad training camp in Pakistan’s Balakot on Tuesday. “The leaders expressed concern on the emerging security situation. Post the statement from the MEA regarding targeting of our military installations and loss of one fighter aircraft, the leaders condemned the Pakistani misadventure and expressed their deep concern for the safety of our missing pilot,” said the joint statement. The Samajwadi Party and National Conference leader Omar Abdullah skipped the meeting. 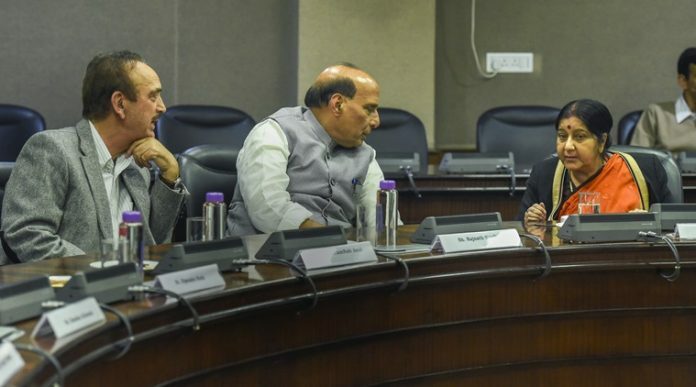 While the SP is learnt to have given its consent to the meet, Omar said he had “requested the Opposition to postpone the meeting in light of the developments, especially after the news of our pilot being in Pakistani custody but they felt otherwise. I chose not to attend as a result”. Sources said West Bengal Chief Minister Mamata Banerjee, her Andhra Pradesh counterpart N Chandrababu Naidu and several other leaders said it is time the Opposition speak against attempts to politicise the stand-off. This was supported by CPM general secretary Sitaram Yechury. The BSP’s Satish Mishra pointed out that party chief Mayawati had done exactly that when she lauded the IAF strikes but wondered why terror camps had not been destroyed earlier, sparing the unfortunate deaths of so many. Sharad Yadav agreed with the suggestion that the Opposition would have to question the government on not just what it is doing but what it did not do.